What's up all you Star Wars junkies? If you've come looking for more some more cool Star Wars lore than you've found the right place. Today's subject 'Darth Vader's Castle on Mustafar', Mustafar being the same lava planet from Star Wars Episode III: Revenge of the Sith where his best friend and master Obi Wan Kenobi destroyed his former padawan Anakin Skywalker, leading to him becoming Darth Vader. The cool story behind the Castle comes to us from CBM, who brokedown the awesome interview between StarWars.com, and Rogue One: A Star Wars Story co-production designer Doug Chiang. CBM: After seeing Darth Vader's castle on Mustafar in Rogue One: A Star Wars Story, it's impossible not to wonder whether we might return there somewhere down the line. If the iconic villain gets his own movie, that's a given, but isn't it somewhere Kylo Ren might want to spend some time given his fascination with his grandfather? We'll have to wait and see, but during a recent interview with StarWars.com, co-production designer Doug Chiang explained the process of creating Vader's home. CHIANG: "Vader’s castle was really fun. When I knew that we were going to possibly go back to Vader’s castle, I loved that idea of, “Okay, let’s establish Vader’s home.” The initial idea was, “Why would Vader live here?” In our minds, we started to come up with a little bit of a backstory. That perhaps this place had special meaning for him, and that this is where he comes to meditate and to heal himself. CHIANG: We started with the idea that maybe it should be built around his bacta tank chamber, and he comes back here to rejuvenate himself and also to meditate. So from there, the structure itself grew out from the bacta tank, and there were certain ideas that we tried. We were trying to go for a very iconic shape, and we always love tall towers. Ralph McQuarrie actually drew quite a few small thumbnail sketches [of Vader’s castle] that were very intriguing. They were kind of angular versions of a tower, and I saw the potential of where he was going, and I just exaggerated that quite a bit." CBM: Chiang then went on to hint that there's more to Vader's castle than meets the eye, hinting that there are unexplored areas which could be revisited down the line. After all, it would be pretty amazing for Kylo Ren or even Luke Skywalker to head to Mustafar in Episode VIII or IX to try and unearth some of its secrets, and it's hard to imagine that Lucasfilm will never consider revisiting this aspect of Vader's life. CHIANG: "If you look at the finished design, it has this very strong element of a structure that was there for a purpose, and that purpose was to draw energy from the lava lake. If you look at the design of the base, it feels very much like a dam, and how the lava flows through it, possibly getting energy. And so we thought, “Okay, well, that’s the foundation. Maybe even deeper, or underneath that, is an even more ancient part, which is a natural cave where Vader goes to meditate.” Visually, we’re trying to create a sort of history for the tower. The bottom is the most ancient, the lava lake dam part was perhaps what Vader built his foundation on, and then the tower was Vader’s addition." 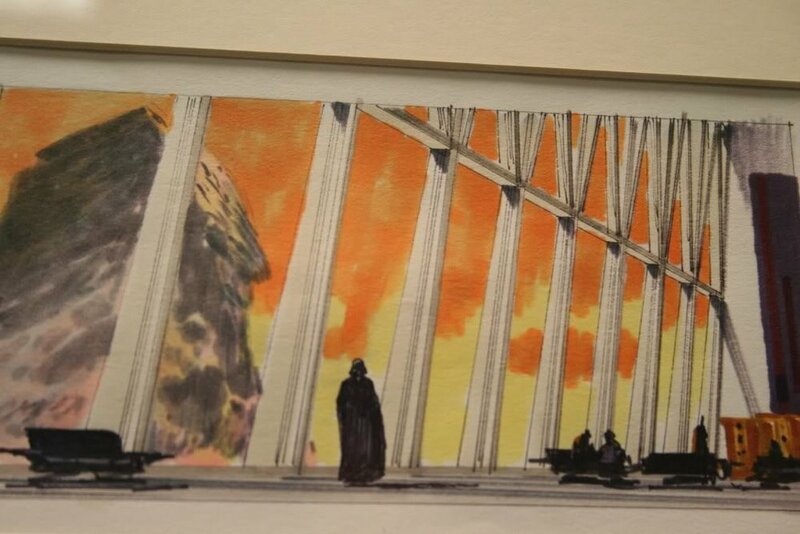 Here are just a few of Ralph McQuarrie's concept art for Vader's Castle from the 70s. If you haven't seen Vader's badass Castle Base in Rogue One: A Star Wars Story on the big-screen yet, then my god people! What are you doing with your lives? As always, thanks for stopping by ECMOVIEGUYS!